Lydgate State Park, located on Leho Drive, south of the Kauaʻi Resort, was named for the Reverend John M. Lydgate, a once-prominant civic leader on Kauaʻi and former pastor of Lihuʻe Union Church and Koloa Church. He was a noted authority on Hawaiian literature, folklore, legends, and land titles. Lydgate served a term as Territorial land agent for Kauaʻi, was a managing director of McBryde Sugar Company, and was the editor of the Garden Island newspaper for a time before his death in Lihuʻe on November 28, 1922. 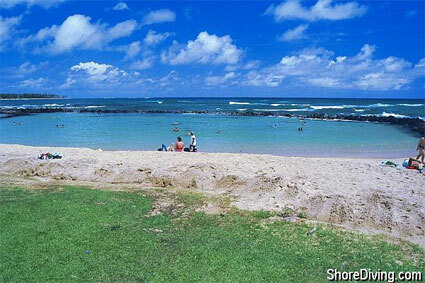 The park is located on the shoreline near the mouth of the Wailua River. It is one of the most popular beach parks on Kauaʻi and attracts many swimmers, picnickers, campers, fishermen, surfers, divers, and beachcombers. Windsurfers also visit the area when south, or kona, winds offer favorable sailing conditions for this side of the island. One of the park's major attractions is its large, double-sectioned salt-water pool. The pool was constructed in 1970 by placing huge boulders in a semicircle facing the beach. The interior of the boulder breakwater is divided into one large, deep pool and one small, shallow pool. Local residents consider the sand-bottomed pools to be one of Kauaʻi's safest year-round swimming sites. The breakwater offers good protection from the prevailing currents and from the seasonally high surf. Signs posted onshore prohibit fishing from the breakwater and warn swimmers to keep off the slippery boulders, especially during periods of high surf. High surf washing over the breakwater deposits all kinds of debris in the pools, and swimmers should be especially cautious of heavy branches and logs that may roll and cause injuries. Lydgate State Park offers a variety of facilities and can accommodate many large groups at one time. Group picnic permits are issued at the state park's office in Lihuʻe.